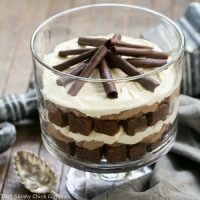 When a holiday or special event rolls around, a showstopping dessert like this Fudgy Brownie Trifle is a must! 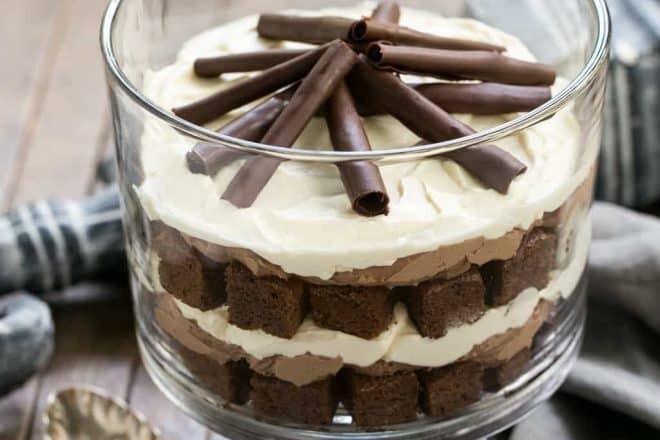 Layers of brownies, vanilla and chocolate whipped cream make a gorgeous presentation and will be a hit with any chocolate lover you know. Chocolate curls or shavings are just the touch to push this trifle over the top! 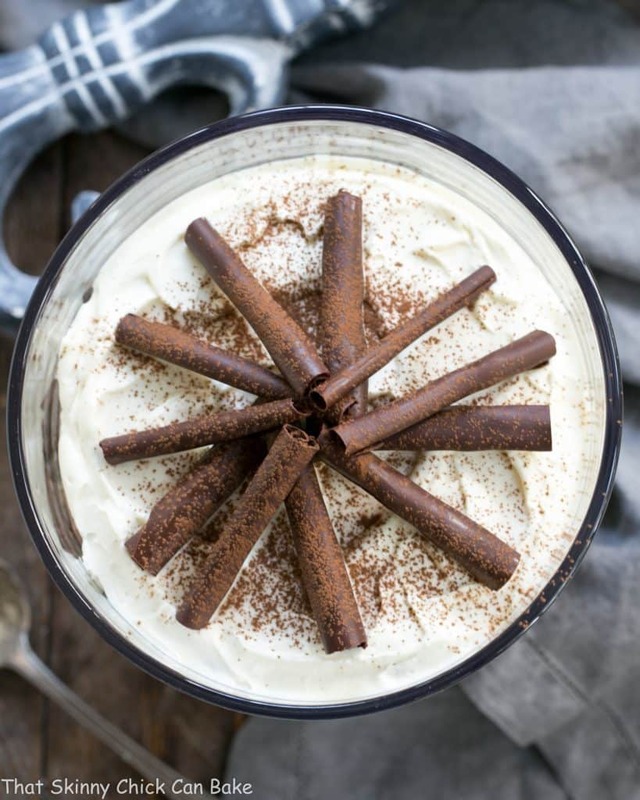 I love a traditional English trifle with sponge cake, jam, custard and cream, but this outrageously decadent fudgy brownie trifle with a whipped cream chocolate mousse may sway you to the dark side. Dark chocolate side, that is! I baked up some fudgy brownies, cut them into cubes and layered them with doctored up vanilla and chocolate whipped creams. I saw Bill eyeing the recipe I had written out that was resting on the counter. He never looks at my recipes, but apparently the aroma of these brownies piqued his curiosity. 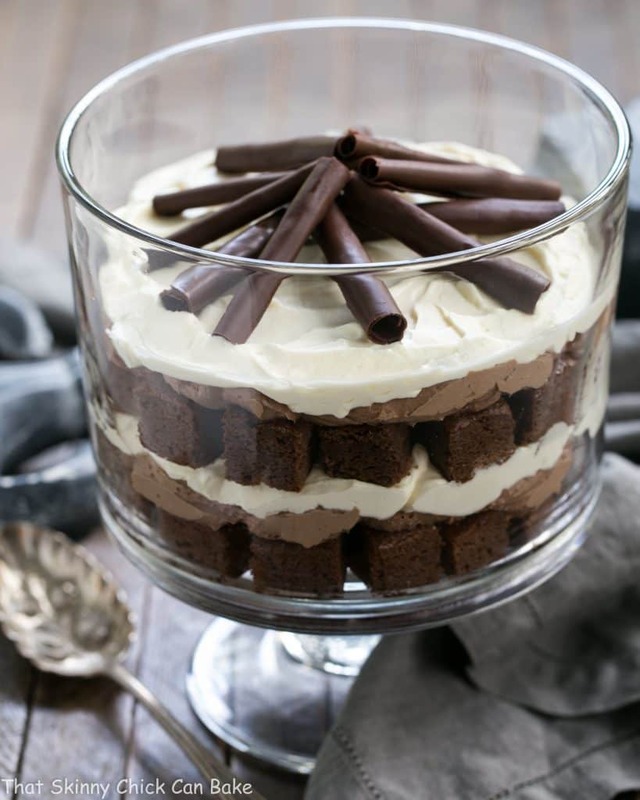 This fudgy brownie trifle with chocolate mousse was a slam dunk hit with the whole family. That rarely happens!! 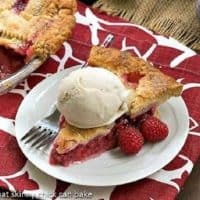 So if you’re hunting for a dessert for Labor Day or any special gathering, give this a try! You’ll want clean, unmuddied layers if you’re using a glass trifle bowl. After putting the brownie squares in the bowl, carefully spoon the filling into the center of the bowl. Using a Small Offset Spatula, spread the filling to the side of the bowl. The fillings can touch the glass, but you want to avoid splattering or smearing the glass sides with the fillings. The classic trifle includes drizzling some liquor over the “cake.” For an adult version, I think some Kahlua would be lovely with the brownies. The options are endless. Use chocolate pudding instead of the chocolate whipped cream, chocolate cake instead of brownies, etc. I used this Trifle Bowl which has a 15 cup capacity. If your dish is larger, you may need to use the full batch of brownies and make extra filling. I used 1 cup of whipped cream for each of the two fillings. The chocolate cream was quite thick so I drizzled in about a 1/4 more heavy cream so it was a similar consistency to the vanilla cream. Feel free to adjust as you see fit. To have the smoothest creams, make sure to sift both the powdered sugar and the cocoa powder or you will have many small lumps. Using cold cream cheese will also prevent a smooth filling so don’t forget to let it sit out on the kitchen counter for at least an hour before using. 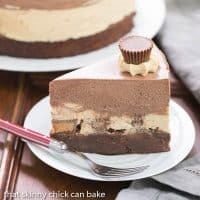 If you’ve never made chocolate curls, check out my technique on this Triple Chocolate Cheesecake post. Warning: it’s tough on a hot day!! This festive Birthday Cake Funfetti Trifle from Melissa’s Southern Style Kitchen is perfect for any celebration! If you’re a citrus lover, this Strawberry Lemon Custard Trifles from Boulder Locavore is another dreamy option! Turtles and Cheesecake collide in this Turtle Cheesecake Trifle from Mom on Timeout! 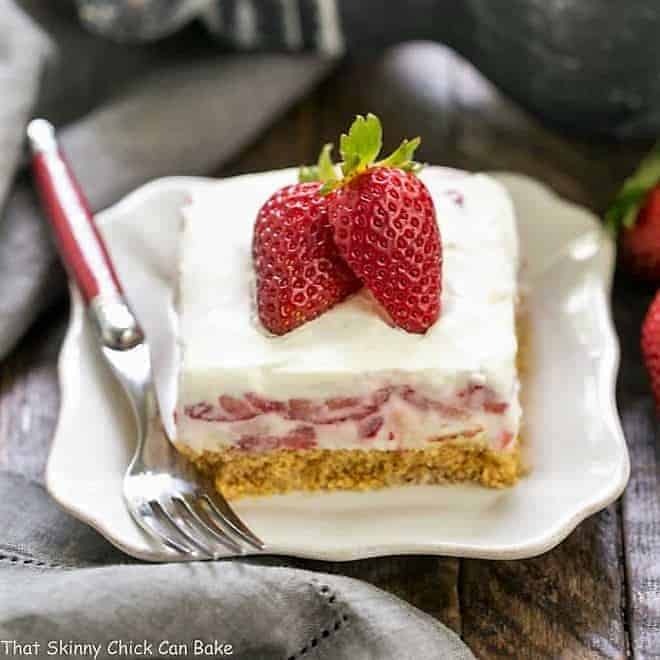 From this blog, there is also a glorious Strawberry Cheesecake Trifle, one of my most popular recipes as well as this Strawberry Trifle with Mascarpone Cream. 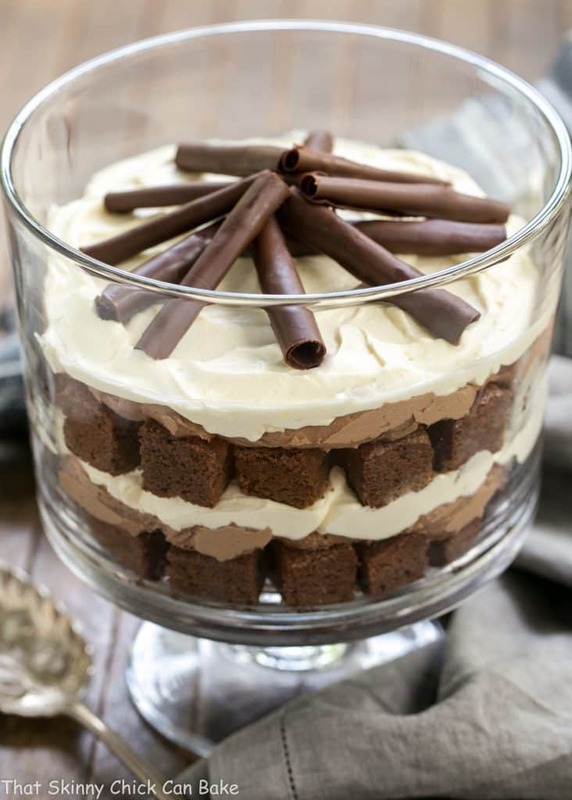 A scrumptious twist on the classic trifle with brownies, vanilla and chocolate whipped cream! Bake packaged brownies according to package. Cool and refrigerate until cold. Or make homemade brownies by preheating oven to 350 degrees. Line a 9 x 13-inch pan with non stick foil. Set aside. 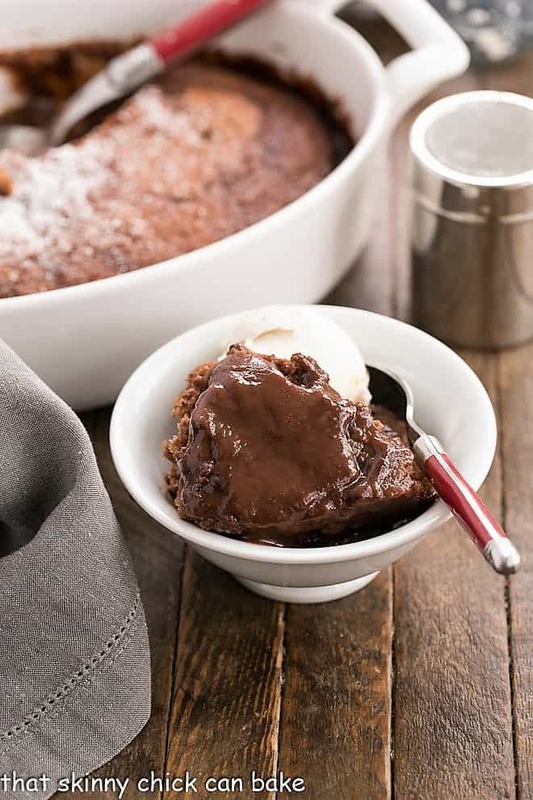 In a large microwave safe bowl, add the butter and unsweetened chocolate. Microwave at 30 second intervals, stopping and stirring until chocolate is melted and mixture is smooth. Set aside and let cool slightly. In a small bowl, whisk together flour baking powder and salt. Set aside. Whisk sugar into chocolate mixture, then whisk in eggs and vanilla (make sure chocolate isn’t hot or your eggs will scramble). Then fold in flour mixture. Pour into prepared pan and bake for about 26 minutes or until a toothpick inserted into the middle of the pan comes out with only a few crumbs. Cool on rack then place pan in the refrigerator to chill. When brownies are cold, make the whipped creams. Put one package of cream cheese in each of two large bowls. Beat each until light and smooth. Add one cup of heavy cream, ½ cup powdered sugar and 1½ teaspoons of vanilla to each bowl. Add the cocoa powder to one bowl. Beat the vanilla only bowl first, until the mixture is the consistence of well whipped cream. Repeat with the chocolate cream, adding up to ¼ cup more heavy cream to loosen the cream as needed. Refirigerate while cutting the brownies. Remove brownies from the refrigerator. Using the foil as a sling, remove the brownies to a cutting board. Cut into 1-inch cubes (I only used about ⅔ of the batch. Save the leftovers for snacking). 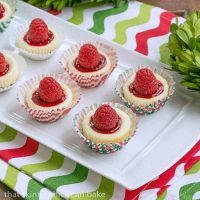 In a trifle bowl or other glass dish, cover the bottom with brownie squares. Top with half the chocolate cream, then top with half the vanilla cream. Repeat with more brownie squares, chocolate cream, then vanilla cream. Garnish with cocoa powder, chocolate curls or berries, as desired. This will be a star in the dessert buffet! Who wouldn’t love this? I’m heading on over, dark side!! I would definitely prefer this to a traditional trifle – love the chocolate on top too, so pretty! This looks delicious Liz! Perfect for Labor Day! I have been dying to make a trifle! I love the simple yet rich flavors of this one. Yum! That looks amazing. The fact that Bill was interested says it all. What a perfect trifle! 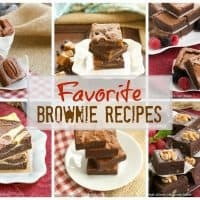 Fudgy Brownies and all the creamy goodness! I cannot wait to have this! Oh my goodness! Do you deliver, Liz? Loving the layers, Liz! Gorgeous! THIS is THE dessert my mom made for all family parties. And I absolutely LOVE it. You’ve outdone yourself here, Liz! I don’t think I could even share this :). YUM! Oh, it looks delicious, Liz! I make one very similar to it and it’s always a hit as I know yours is also. A perfect dessert to make everyone happy! No wonder Bill was hanging around, this is surly a show stopper! My absolute favorite things in a trifle! Pinning this gorgeousness Liz!! When my husband is curious about a recipe, he would ask me how it’s made. He would later recite it back to whomever is asking as if he makes it all the time . Haha! This trifle looks delicious and decadent, Liz!! It’s so perfectly layered too! I have always found layering in glassware a bit of a challenge. Making chocolate curls sounds really fun AND the fast track to my children’s hearts. Off to check out your tutorial. 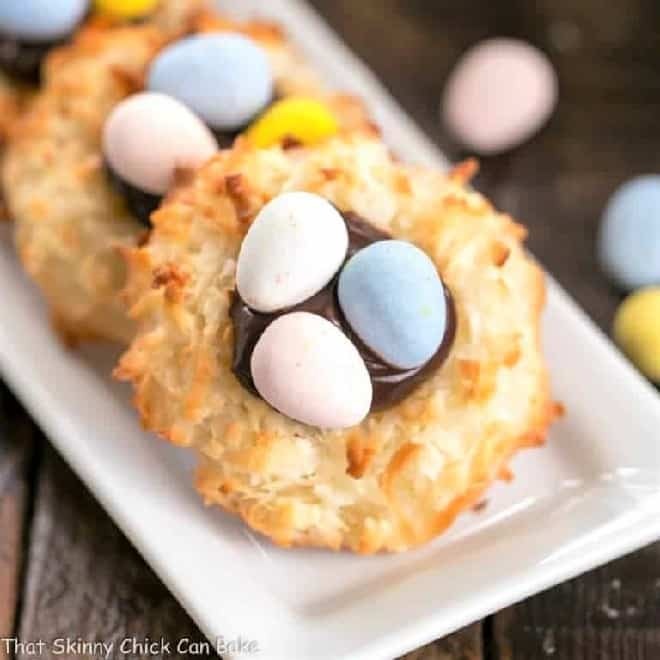 This looks fantastic and easy to prepare!!! YESSSSSSSSSSS! Loving all that chocolate, rich, goodness!! Looks so delicious. Oh my goodness Liz you are pulling out all the stops! This is a beautiful presentation. 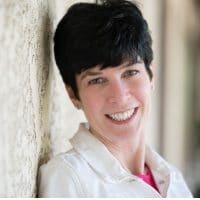 Hi, Janet! Thanks for catching my omission. Yes, I meant 2 (8-ounce) packages of cream cheese. I’ve edited the recipe.